This is a very basic tutorial to explain how to use a whip stitch seam to join crocheted fabrics together. The whip stitch seam is an extremely easy seam to create and it can be worked in various ways. It is not completely invisible. My preference is working the whip stitch in the front loop/back loop of the stitch, with the front/right side (RS) of the crocheted fabric facing me. Step 1: Thread a yarn needle with a piece of yarn approximately three times as long as the edge you wish to seam (join together). Step 2: Line up the edges of the crocheted fabric, with the right-sides facing up. Beginning at the far right edge of the crocheted fabric, attach the yarn. 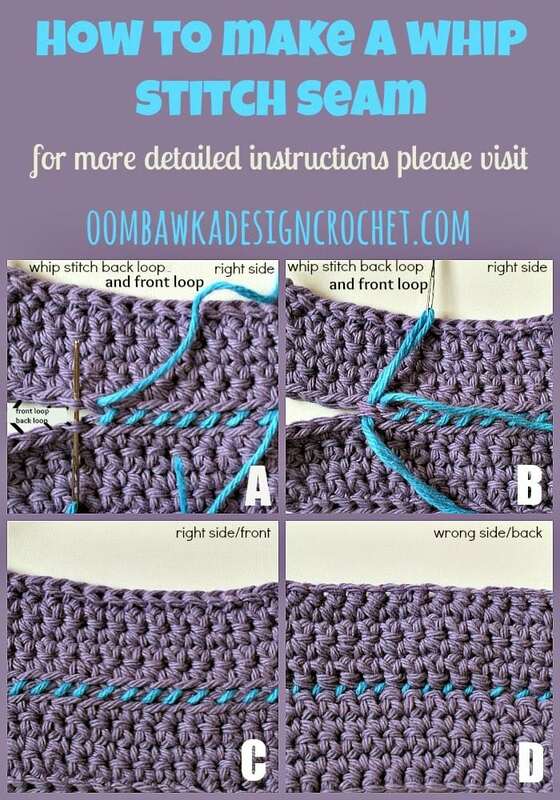 One method to do this is to insert the needle through the end stitches on both pieces of crocheted fabric, from bottom to top. While holding the yarn tail in hand, pull gently to tighten the stitch and repeat. Release the tail and begin Step 3. Step 3: Insert the needle into the innermost loops (back loop/front loop) of the next pair of stitches (A), from bottom to top and pull gently to tighten(B). Step 4: Repeat across, weave in ends and finish off the yarn. Image C is the front view (RS) of the finished seam and Image D is the back view (WS). Note: You can go from bottom to top, or top to bottom – whichever is easier and more natural for you – just be consistent and do the stitch the same way each time. As noted above, you can work into both loops or back loops only – when you work into both loops there will be more bulk to the seam. Thanks for sharing this trick!